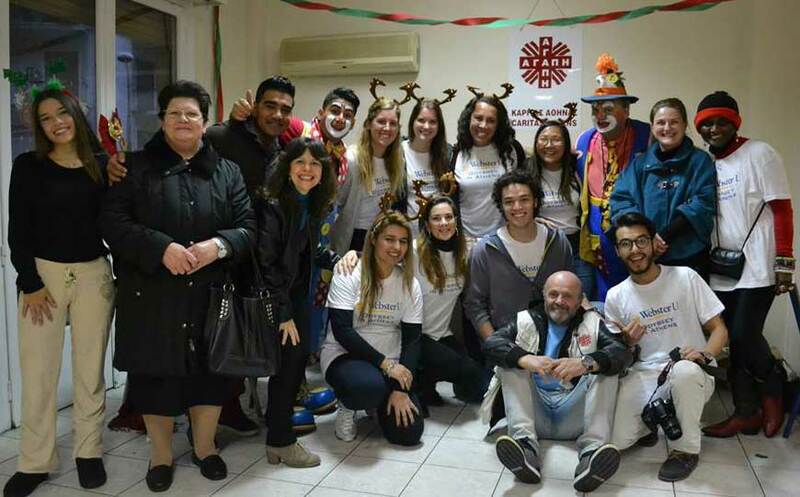 On Dec. 16, Webster Athens study abroad students, armed with bags of presents for over 100 children, marched to Caritas Refugee Center in Athens to bring some joy and happiness to the refugee children. The students helped transform the center, where the children usually come to eat with their parents daily, into a festive holiday wonderland, complete with toys and supplies for the holiday celebration. The planning for the party began several months ago after the students participated in the Webster Works Worldwide day and volunteered serving meals in the soup kitchen. When Dina Skias, director of Student Affairs and Odyssey in Athens Study Abroad Program, suggested the idea of a holiday party for the children, they were very excited about doing something special and immediately began preparing for it. The students did their own fundraising and with the money raised, they purchased art and craft supplies, decorations and toys for the children to play with at the party. Gift bags for each child included a coloring book, crayons, bouncing ball, a stuffed animal, bubbles, balloons, one main toy item, candies, tangerines and a juice box. The students also purchased 130 pairs of socks, 100 hats and 100 sets of gloves of various sizes. Also, they bought needed supplies for the center such as diapers, diaper cream, canned milk, spaghetti, rice, tomato sauce, coffee, tea and sugar. The center was arranged in sections where the children had a chance to do arts and crafts – or play with the many toys that were purchased, in addition to getting their faces painted by one of the regular volunteers, who is a professional face painter, and getting entertained by Toto the clown, who was hired for the event. The clown was a huge success and the children never stopped laughing and playing. Toto involved some of the children and parents in his performance as well as giving out gifts of balloons made into various animals. After three hours of having fun, they were ready to eat the pizza ordered for them and their parents. As the party came to a close, Santa arrived in time to pass out their presents as they left. Vice-chancellor for Academic Affairs Susie Michailidis represented Webster Athens at the festivities. “More than 5 million children are suffering as consequence of horrific conflicts in our wider region," said Michailidis. "These children need champions to offer them protection, happiness and a bright future. The Study Abroad Students have today become their champions. And, I can assure you that Webster Athens will continue supporting Caritas in its mission to protect children of refugees through distribution of clothes, blankets, food and emotional support initiatives”. 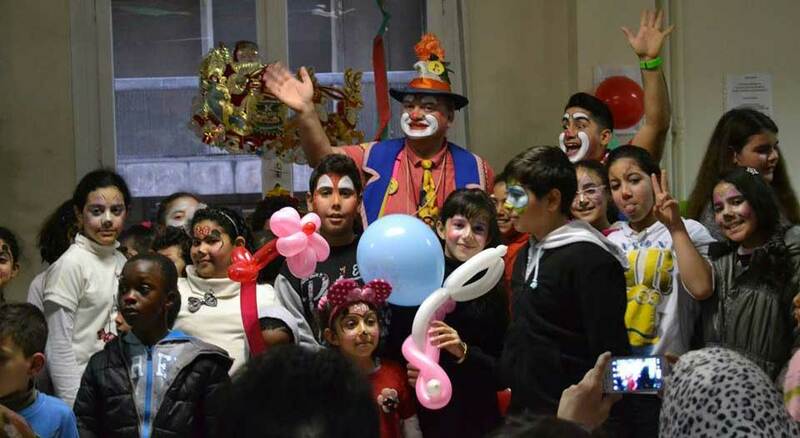 The Caritas refugee children’s party was also attended by Ellie Despotaki, academic advisor and coordinator of special programs, and Antonia Dimou, Admissions director.